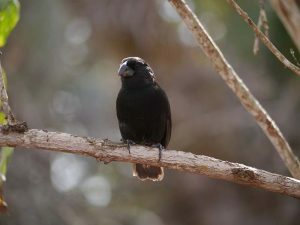 Darwin’s finches are a group of fourteen species of finch, thirteen of which are endemic to Galapagos, the other to the Cocos Islands off the coast of Costa Rica. Their name is in reference to British scientist Charles Darwin, who discovered these small birds during the voyage of the Beagle to the Galapagos Islands in 1835. His discoveries during the expedition helped him to formulate the theory of evolution that is so widely renowned today. One of the reasons that Darwin was so intrigued by the finches was due to the massive variation in beak size between what were incredibly similar shaped, sized and coloured birds. He presumed that these birds must have adapted to their unique environments to make survival easier. This is highlighted by the variation of the diets of the birds, as their beaks are more adapted to the food sources available to them. For example, the green-warbler finch has a long pointed bill, making it very efficient at foraging through plants and bark to find small insects. The large ground-finch needs a more rounded, larger bill to crack open large seeds that other finches would not be able to exploit. All of this evidence assisted Darwin in presenting his ideas, which were very controversial at the time. Darwin’s finches have survived for hundreds of years without experiencing a decline in population due to a lack of predators apart from some larger birds, such as the short-eared owl. However, since human colonisation of the Islands, introduced species and diseases have caused problems for the birds. Purposefully introduced species such as cats hunt finches as well as species accidentally brought to Galapagos, like invasive rats. Avian pox, previously unknown on the Islands, is a disease transmitted by mosquitoes that finches are also often affected by. 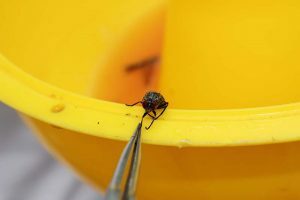 Another invasive species, the fly Philornis downsi, causes massive problems for finch nests. This is because the larvae of the fly infest the plant material of the nests and feed on recently hatched finches, sometimes causing up to 95% nestling mortality of clutches. 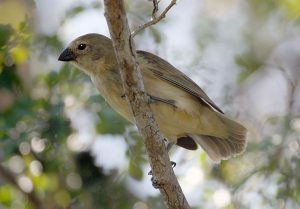 This can cause problems for the rarer species, such as the mangrove finch which has undergone a rapid decline in population and is now Galapagos’ rarest bird species. Galapagos Conservation Trust (GCT) has been the main funder of the Mangrove Finch Project, a conservation effort to save these birds from extinction. In January 2014, the project helped to raise fifteen mangrove finch chicks in captivity, before their release into the wild. This continued and now over 30 chicks have been re-released into the wild. This project will continue until the threat of the Philornis downsi is removed, to continue the trend where no bird has gone extinct in Galapagos since Darwin’s time. These amazing birds that have shaped revolutionary ideas and helped us better understand wildlife all over the world, need to be protected. They have an incredible history and cannot be lost to extinction. Conservation initiatives are effective and have had a positive effect on the populations but more help is needed. You can help by donating to GCT to help fund these projects and save these beautiful birds. Categories: Uncategorized, Wildlife of Galapagos.